Welcome to Southern Comfort! Modern living room leading to the front porch. Inviting space to quietly read a book. The large flat screen television is easily visible. Pocket doors lead into the kitchen. Well designed kitchen area. Stainless updated stainless steel appliances make cooking easy. Breakfast bar. Light flooding in from the porches. Sleek reading nook. Mixtures between antique and modern keep this place funky and fun. Plenty of room for pups to lay down. Entrance to the bathroom and the outdoor space. 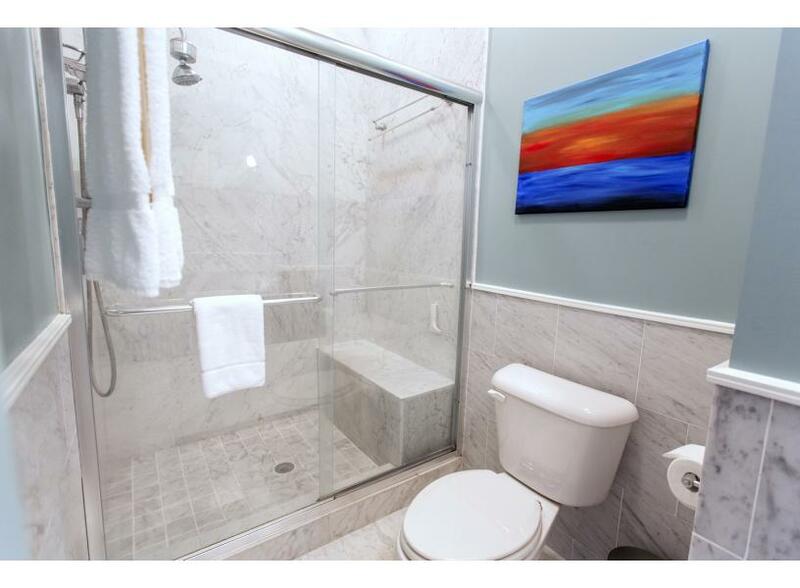 Newly renovated bathroom with sit in shower. The large closet with washer and dryer makes it easy to unpack. Extra pantry space. Pups of all sizes come on over! 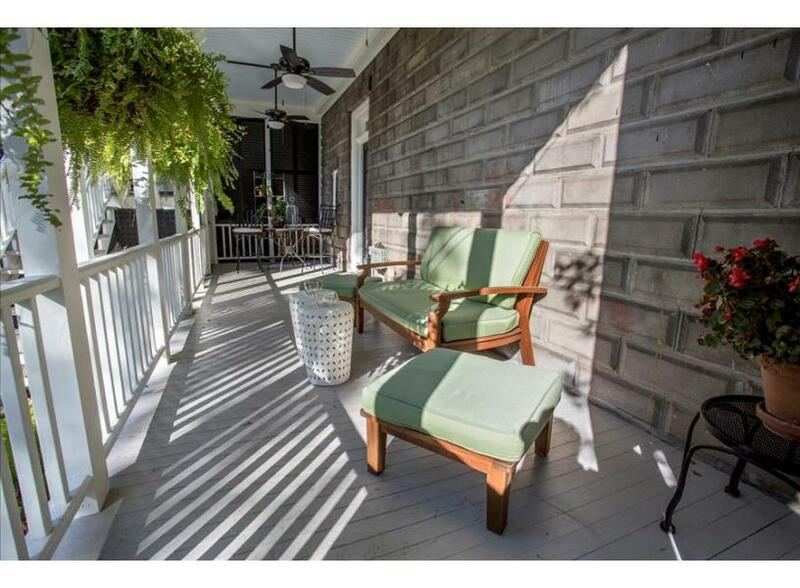 Nothing says Southern Comfort like enjoying the evening air with a glass of sweet tea on your front porch. Just a few blocks from Forsyth Park, this pet friendly home has everything you’ll need for a weekend getaway or longer, extended stay. The large, modern living room has two French doors that let in plenty of natural light, and lead to the front porch. Decorated with local art, the large flat-screen TV is set upon an easel and can be seen from anywhere in the room. 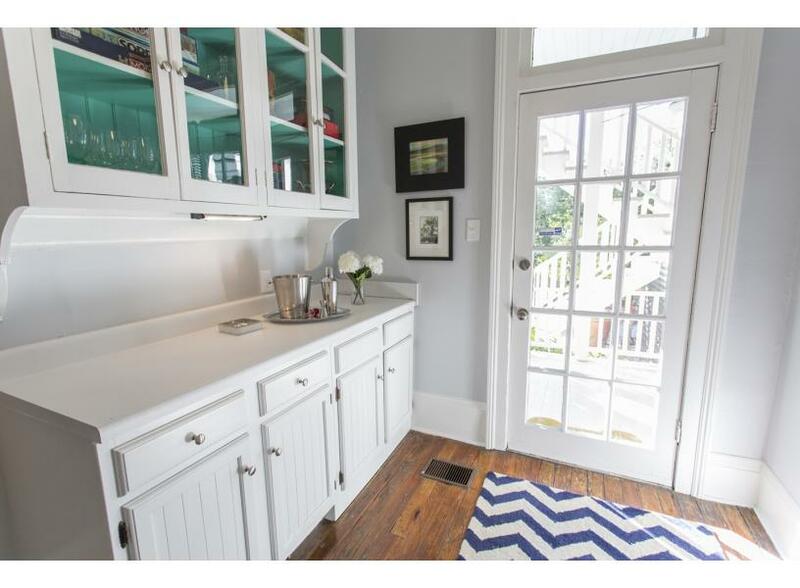 Pocket doors lead into the eat-in kitchen. The large island and stainless steel appliances make cooking a pleasure. Enjoy a quick meal at the breakfast bar or an intimate dinner at your private table for two. Just off the kitchen is the renovated full bath, which has a large vanity and a shower with a built-in seat. 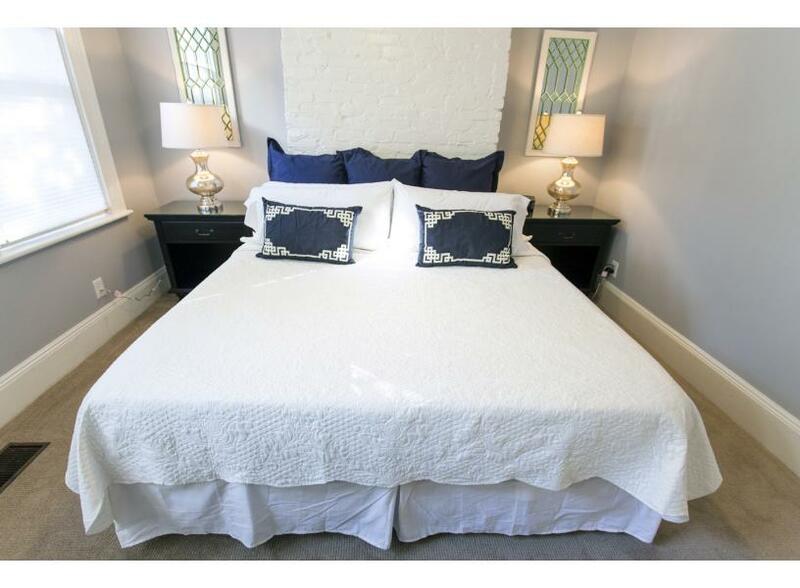 The king size bed is perfect for curling up in after a long day of exploring Savannah. 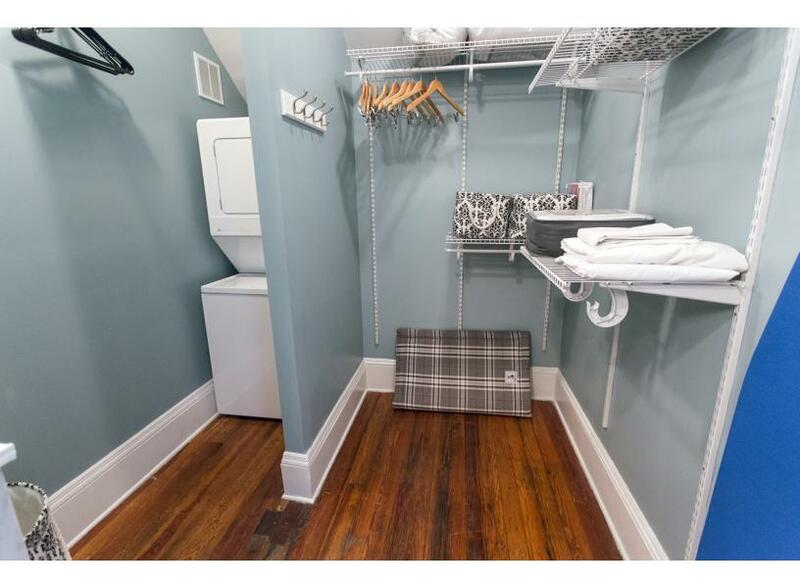 The large closet provides plenty of space to unpack and settle in, and includes the convenience of a stackable washer and dryer. - Our favorite local package store (Johnnie Ganem’s), national grocer (Kroger’s), and local caffeine spot (Mate Factor Cafe) are all within a 1 block walk. - Southern Comfort is not only dog friendly, but one of the few rentals in Savannah with flexible size restrictions. We can welcome your dog companions at this pet friendly home, but ask that you find other arrangements for cats, birds, and other furry friends. There is a $75 pet fee (non-refundable) per dog and a limit of 2 dogs per reservation. Please inquire for more information if your dog is larger than 35lbs. Very well kept and beautiful place to stay! What an awesome location to stay in Savannah with your pup! Within walking distance to everything. Forsyth Park is so close and another favorite of mine was the City Market. It was a perfect setting for our visit to Savannah! Perfect location. Very walkable; no problem with parking. Grocery store nearby. Free trolley to downtown nearby. Apt was above expectations very comfortable. Highly recommend. We were so impressed with this rental - just as described in the photos; however, I did not realize just how close to things the house was located. You can get to the liquor store (with a wonderful wine selection) in less an a minute walk (seriously, a minute) and the grocery store is just a few short blocks away. You're in walking distance to Forsyth Park and all of the historic area of Savannah. We did not rent a car, but took an Uber from the airport for $23. We took an Uber to and from dinner one evening when it was raining, and that was $6 each way. We love the charm, culture, history and architecture of historic Savannah, and this house gave it all to us at our fingertips! We would recommend it, and we would stay again. My husband and I love the southern comfort and flair and Savannah is just the place to experience it. Having such a beautiful home base made it even more pleasant !! Its location in the middle of the very quiet historical center with its beautiful parks and totally manageable walkswas a plus! The very well thought out design of the rooms also provided a great "nest" for us. A definite place to come back to for us. Thank you for all your availability and help !!! My husband and I stayed here a few years ago for our honeymoon and decided to revisit Savannah for our babymoon. We really enjoyed our first stay at Southern Comfort. 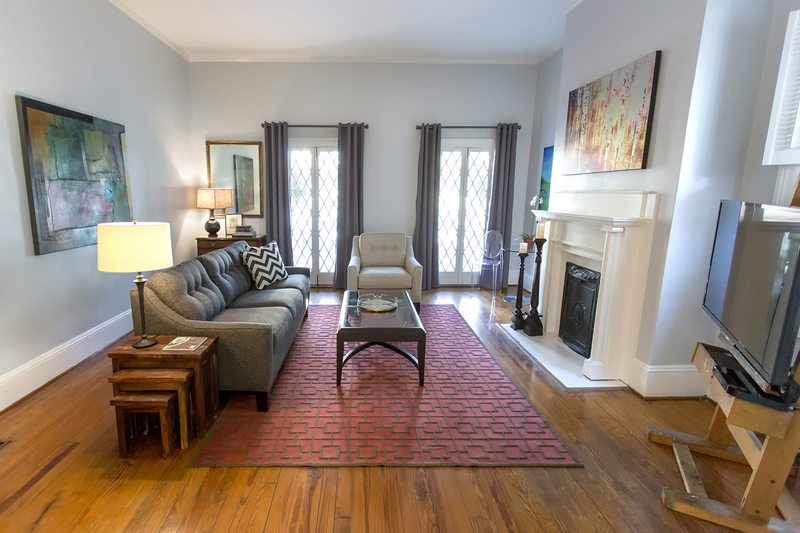 The home is close to Forsyth Park and not too far from all the restaurants and fun of historic Savannah. My only complaint about this stay was the home smelled like pets. We brought our dogs and enjoy a pet friendly rental, but the home seem to have a residual pet smell which we did not appreciate. Overall, we would recommend this rental.. we just suggest that the cleaning crew does some deep cleaning- especially the couch and rugs! Perfect location close to Forsythe Park. Can walk anywhere in Savannah from here. Clean and roomy, great back porch. This was our second stay here and we have already booked our third! Southern Comfort provided a great location to all the activities that we wanted to do. Within steps of Kroger, Sentient Bean, Mate Factor bakery and Starland. Also a new brewery, Two Tides just opened in Starland. Very comfortable place to stay with easy access and very few steps to climb as you can see in the picture of the home. We have already booked another stay in the spring of 2019. Beautiful space, plenty of room. 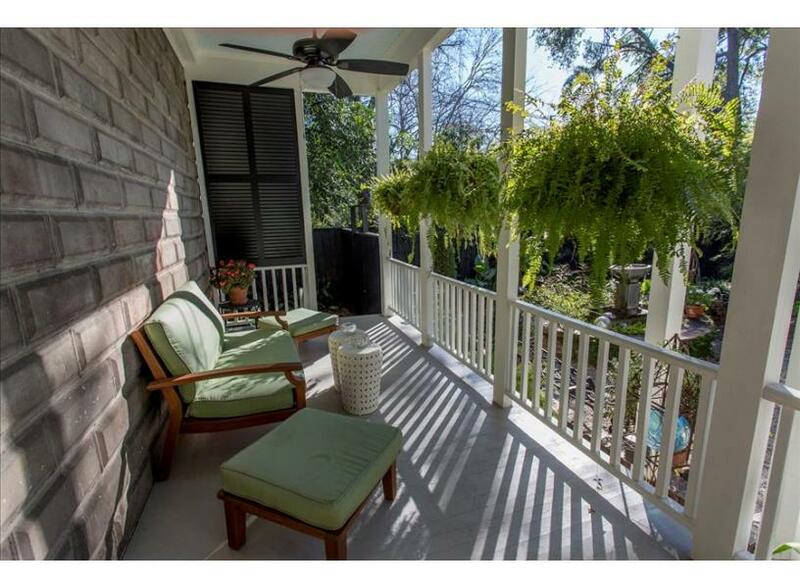 Nice neighborhood within walking distance of Forsyth park. Lucky Savannah great to work with. Located just three blocks from Forsyth Park and a free Dot bus ride to restaurants, shopping and sights. Garden is not available for your dog but a good neighborhood to walk the dog and see historical homes. No where to put a weeks worth of trash identified. Rooms are as pictured. Loved this property. Centrally located and had ample space. Close to all of the squares and grocery/liquor stores. Would absolutely visit again. nice and welcoming. We felt like we were at home. It was clean and neat and we were so relaxed. Wonderful place to stay especially with larger dog. Our rescue Doberman enjoyed herself so we did too! The rental unit was very clean and well-stocked and so close to parks, coffee shop and Kroger. I would definitely recommend this to anyone but especially if you have a dog. We loved staying in the littlw apartment. Our 3 year old daughter was able to play and snack with the open floor plan and kitchen. She particularly loved the shower. It was our first experience staying in a non hotel property and would definitely stay again. We loved that parking was on the street right in front of the house. Kroger is just a few blocks, maybe a 10 minute walk from the apartment. The occupants above her friendly, they offered their house if we lost power due to hurricane Michael. I can't say enough about this resident. Very charming lower flat that was a quiet and restful getaway nestled inside a beautiful and historic city. The flat was comfortable and had everything we needed. It was very clean and nicely decorated. Location was ideal, weather was warm and provided a very pleasant break from our normally cold northern November/December weather. Overall, a great place to stay in a very special city. John, thank you for choosing Lucky Savannah! We're so glad to hear that you enjoyed your time at Southern Comfort and look forward to hosting you again soon. 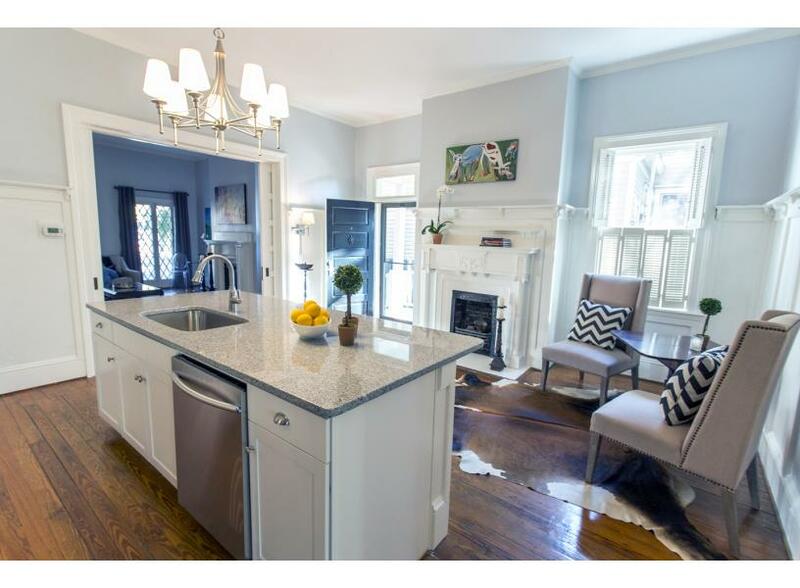 This property is in a great location, steps away from Forsyth Park, as well as Dot transportation. The property was clean, well maintained and beautifully furnished. Management was very friendly and helpful. We look forward to to visiting again. We did like the kitchen, the back covered porch, the location, and the property was well-lit. We also liked having the driveway where we could park, just be sure the car doesn’t block the sidewalk. While the bed was comfy, we found the furniture in the living room to be extremely uncomfortable. It is a pet friendly location, but the fencing in the walkway area is not very secure for small dogs – there is a gap where two of the fence panels meet and the slats on the gate are too far apart. The folks that live upstairs are very nice; the noise from upstairs is minimal, mostly footsteps when they are walking around. They were fostering a rescue dog that unfortunately was extremely aggressive and unfriendly towards strangers and other dogs. The back covered porch was the best feature of the rental, but if the foster dog was outside, we really couldn’t enjoy it, or we would go back inside. When coming from downstairs to the courtyard, the dog could see in to our rental from the landing and if it saw us or our dog, it would start growling and barking so we kept the blinds closed most of the time. They mentioned they would be moving the dog to another location later in April, so for future guests it won't be a problem, but it did put a bit of a damper on our stay. Thank you so much for your comments. We do regret the impact the foster dog had on your stay. Fortunately the homeowners have found a new home for the foster pet as of April 30th, 2018. This is one of our most popular rentals and the homeowners take great pride in addressing all guest feedback. As of May 5th, 2018 the sleeper sofa in the living room has been updated with a brand new one. We look forward to hosting you again, and thank you for your helps Lucky Savannah and our homeowners continuously improve our guest experiences. Thank you so much for your comments. We do regret the impact the foster dog had on your stay. Fortunately the homeowners have found a new home for the foster pet as of April 30th, 2018. This is one of our most popular rentals and the homeowners take great pride in addressing all guest feedback. As of May 5th, 2018 the sleeper sofa in the living room has been updated with a brand new one. We look forward to hosting you again, and thank you for your helps our company and our homeowners continuously improve our guest experiences. Thank you so much for your comments. We do regret the impact the foster dog had on your stay. Fortunately the homeowners have found a new home for the foster pet as of April 30th. This is one of our most popular rentals and the homeowners take great pride in addressing all guest feedback. As of May 5th the sleeper sofa in the living room has been updated with a brand new one. We look forward to hosting you again, and thank you for your helps our company and our homeowners continuously improve our guest experiences. Thank you so much for your comments. We do regret the impact the foster dog had on your stay. Fortunately the homeowners have found a new home for the foster pet as of April thirtieth. This is one of our most popular rentals and the homeowners take great pride in addressing all guest feedback. As of May fifth the sleeper sofa in the living room has been updated with a brand new one. We look forward to hosting you again, and thank you for your helps our company and our homeowners continuously improve our guest experiences. Thanks again for choosing Lucky Savannah, Stacey! An exceptional way to escape into the wonders of Savannah, complete with a hidden garden, superb hosts, and lovable dogs. Ina, thanks again for choosing Lucky Savannah! We look forward to hosting you at Southern Comfort again soon. 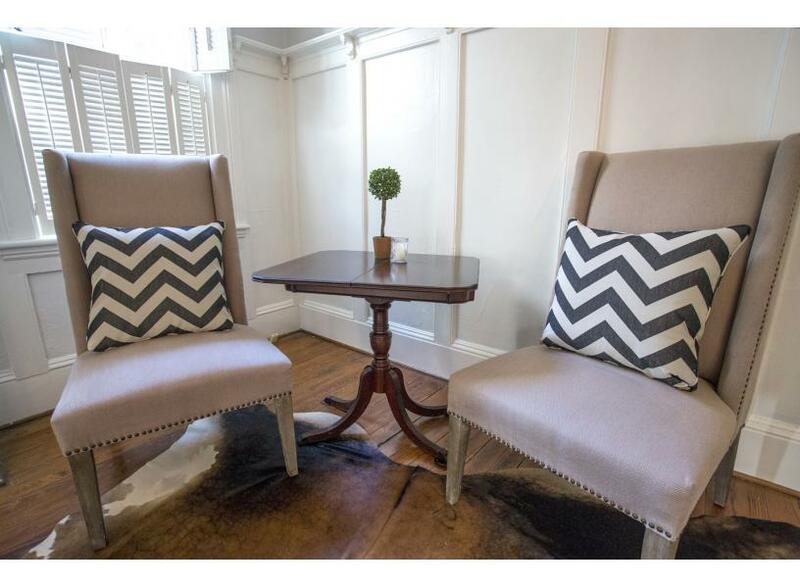 The house is charming, with large rooms and very tastefully decorated. The furniture looked new and was so comfortable we decided to upgrade our family room chairs to ones that are deeper as theirs was. There is a charming coffee shop a block away with the best olive bread ever (we froze a loaf and brought it home. Kroger is a block away. Walking around was lovely but the unevenness of the herringbone sidewalks and cobblestones were challenging. 700 Drayton is a must do experience, less for the food and more for the "wow" factor of the art. Visit the gallery/shop right next door. We bought jewelry, bow ties with wonderful feathers. I think being there during the azalea festival would be fabulous. This house was perfect for our stay in Savannah. 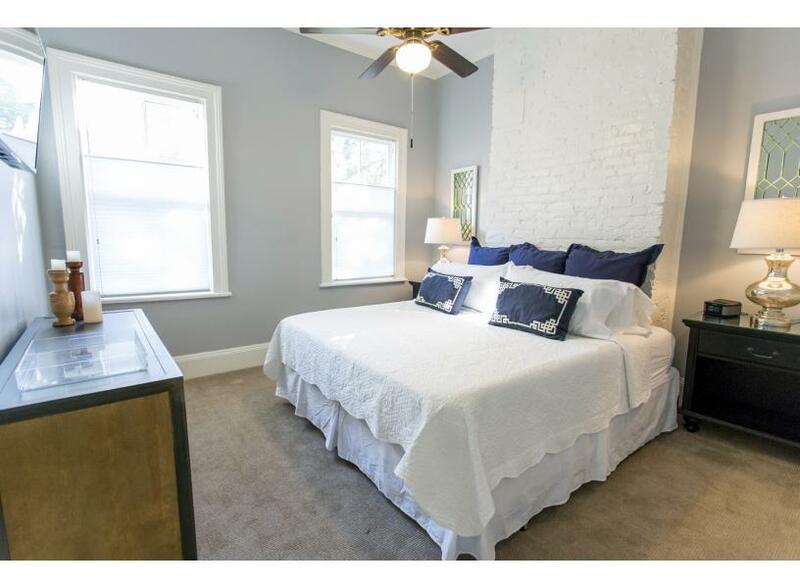 Only a few blocks from Forsyth Park and walking distance to pretty much everything. Our dogs also enjoyed the space and all the walking! Thanks again for choosing Lucky Savannah, Michele! We hope to host you again soon. As we were in Savannah for our daughter's wedding, this rental was convenient to the wedding venue, rehearsal dinner venue and to all the of the historic district. Krogers was within walking distance or a very short drive if raining. We found this home to be our home away from home. Very clean, everything we needed was in the home. Perfect locations for walking out dogs. 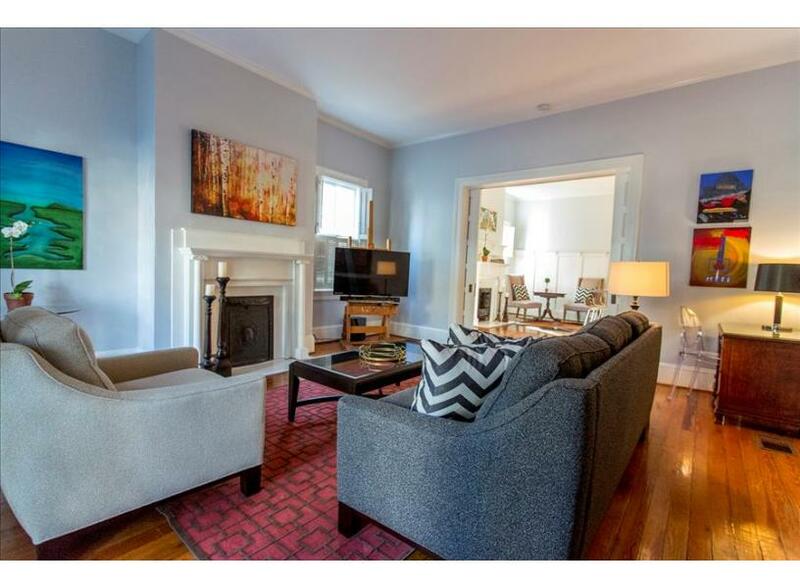 I would gladly recommend this rental home to anyone who visits Savannah in order to have all the comforts of home. Overall, this is a great apartment in a great area. I recommend staying at this apartment. For a perfect score, I recommend a deep cleaning of the bathroom. We chose this house because of the charming pictures and because it was dog friendly. It certainly lived up to all of our expectations. We especially loved the courtyard and water fountain. Lucky Savannah was very helpful with all of our questions and the home owners were extremely accommodating. Thank you for letting us stay in your magical home! If the internet had worked properly or at all this place would get 5* It was very slow on day one and a msg was sent but no response. On day 2 the internet did not work at all. We live in an internet world rather we like it or not so this one needs attention. I ended up paying for service with infinity. This home was well-maintained, comfortable, stylish, and close to everything. Our dog seemed to settle in right away which was also a great sign. Staying in a neighborhood was a much richer and "real" experience than one would have in a hotel. Lucky Savannah was also wonderful to work with, and the app was a great feature. 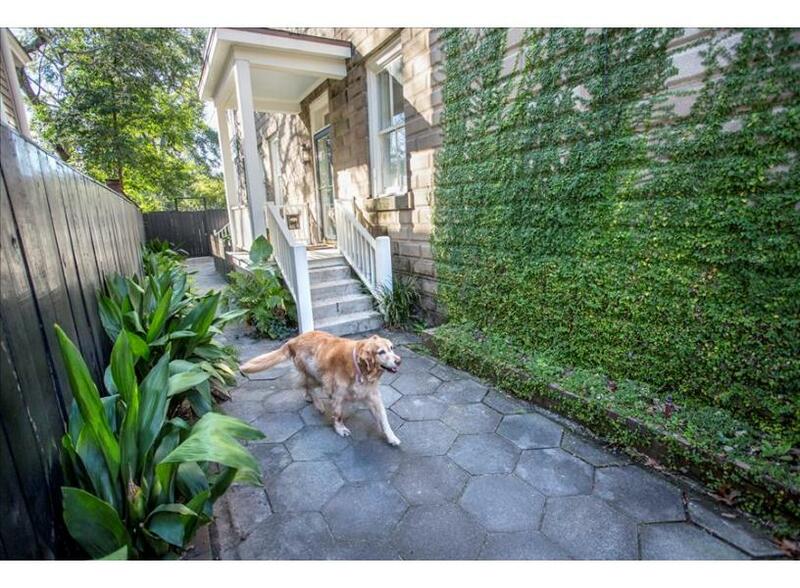 If you are looking for a dog friendly home for your visit in Savannah, consider this home. My only suggestion for the homeowner would be to possibly clean the shower heads - they've started to get some buildup! House and location were fantastic. Thought when we first arrived the supplied door code did not work! However I texted Lucky Savannah and got a new code immediately. Will be back for sure! The apartment was clean and exactly as described. The kitchen was well stocked and beautiful. The bedroom was comfortable and I especially appreciated the large laundry room. The location is technically walkable into downtown, however I would recommended driving when it’s hot as parking was easy and reasonable. We also had no problem finding street parking in front of the home. Our only complaint was the upstairs neighbors- they let their dog outside in the morning and we were woken up both mornings to the dog barking. As dog owners ourselves, we understand that dogs bark, but there didn’t seem to be any urgency on the part of the owners to quiet the dog or put him back inside. The house was charming and I enjoyed my stay there. The decorations were lovely and I liked the enclosed garden area for my dog. I liked I could walk to Forsyth Park and was close to the downtown historic area. A great place to stay as it is dog friendly. We stayed in this unit for Christmas with our teenage daughters and our beloved Boxer, Daisy. THe location of the property was perfect. It's walking distance to groceries, as well as an excellent coffe/tea shop, which we visited every day. WE also brought our bikes and rode around Savannah. Savannah has great restaurants and lots to do and see. We would stay at this property again for sure! We had a wonderful stay at Southern Comfort where we had all the comforts of home. The bed was so comfy the kitchen was well stocked. The furniture was perfect. We had to extend our stay for s few days and Cliff was absolutely tops. We were very fortunate to find such a lovely home, convenient to town, with such an amazing owner. Five Stars!!!! This property was well appointed and had everything we needed for our week long stay. It was a great home base for our tour of Savannah. The southern comfort house welcomed us and our big lazy dog for a 3 night/4day stay. The accommodations were clean and quiet, and Cliff (who I think owns the house) who lived in the home upstairs with 3 golden retrievers was so friendly and hospitable. I highly recommend Lucky Savannah and the home we stayed in and would happily stay there again! It's so nice to be able to bring our dog with us when we travel. We enjoyed our stay so much. It was a home away from home because we felt so comfortable surrounded by everything you need. The decor was excellent. The place was immaculate and close to so many stores and coffee shops. We go to Savannah often and this would be my choice of where to stay because we have stayed in so many during our vacation to Savannah and this is our favorite. Thanks so much. Our dog Gunther enjoyed it also. We would definitely stay here again. The property was meticulously maintained and decorated. We loved the location. Hi Erica! Thank you so much again for choosing to stay with us. We're so glad to hear you enjoyed Southern Comfort and that it was cleaned and decorated to your expectations. Please know that you're privy to our Friends and Family discount next time you stay with us. Looking forward to hosting you again soon! 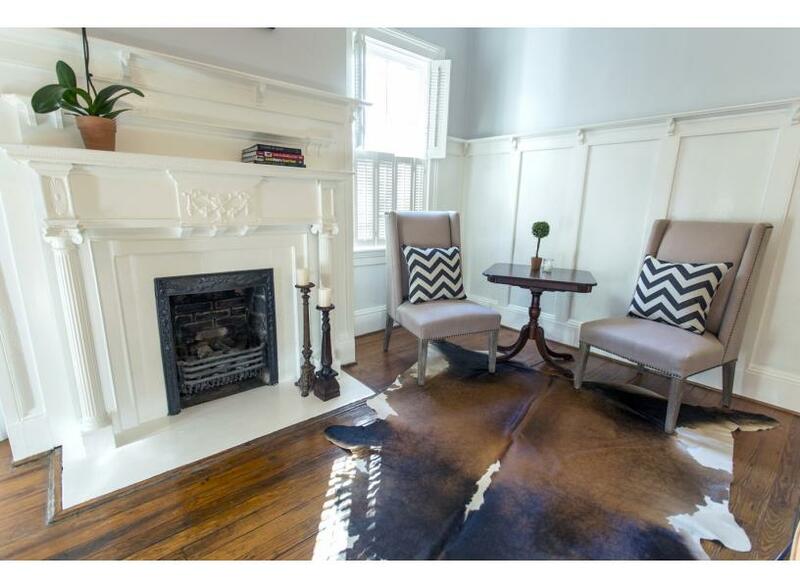 We fell in love with this luxurious classically renovated home the moment we walked in. The design and decor of the space is impeccable! Beautifull front porch and very private back porch with a very lush garden and lovely relaxing sound from a beautiful fountain in the middle of the garden. All the comforts of home including a well stocked new kitchen and an excellent quality king size mattress. All this nestled in a great location with a great little coffee house a street away and restaurants nearby as well as Forsyth Park. We met our host, Cliff by happenstance, a very nice and attentive fellow. Thank you for everything Cliff, we truly enjoyed our stay!! We had a wonderful time. The location was within walking distance of everything we had planned to do. The accommodations were outstanding and the hosts were extremely friendly and we enjoyed interacting with them. Looking forward to our next visit. Hi John! Thank you so much again for choosing to stay with us. We're so glad to hear you enjoyed Southern Comfort and our beautiful city. Please know that you're privy to our Friends and Family discount next time you stay with us. Looking forward to hosting you again soon! Beautiful, clean and comfortable. We loved everything about the apartment. Great location. 2 blocks from Forsyth park. Easy walk to all restaurants and shops. 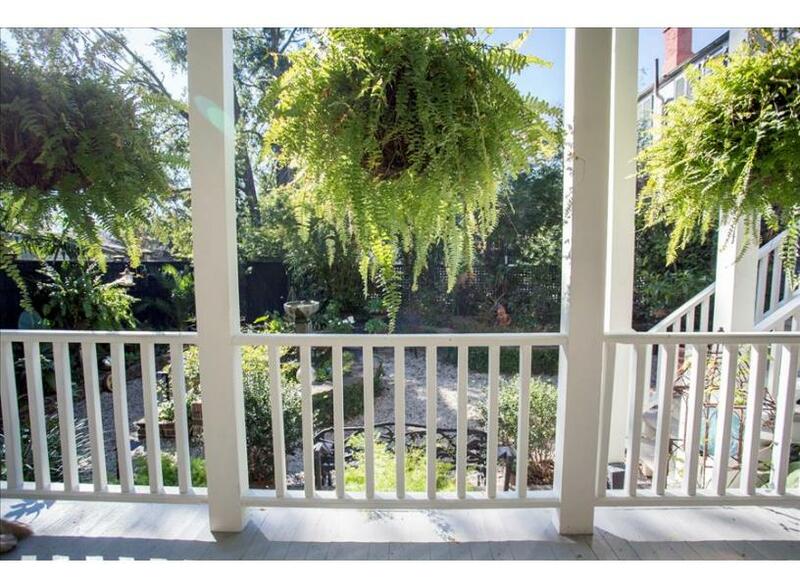 Lovely back porch overlooking a charming garden. Hi Cindy! Thank you so much again for choosing to stay with us. We're so glad to hear you enjoyed Southern Comfort and we look forward to hosting you again soon. Wonderful courtyard garden and home. Great location. We enjoyed everything about the home! Very clean and lots of room! Owners were great and our dog Skye enjoyed visiting with them and their dogs! Will definetly stay here again! Hi Victoria! Thank you for staying at Southern Comfort. We look forward to hosting you again soon! Charming first floor apartment. Parking was never an issue. Great bathroom. We enjoyed having drinks on the side porch overlooking the garden. Very relaxing place to stay. Thank you for experiencing the magic of Southern Comfort, Julie! We look forward to your return. Southern Comfort only begins to describe this lovely, well kept and updated historic home just blocks from Forsyth Park. I rented this property for a girls weekend and couldn't have been more pleased. The location on Huntingdon Street was close enough to easily get to all of the places we wanted to visit in the Historic District, and if we didn't feel like walking, an uber or pedicab was an easy option. The home itself is just gorgeous, and we so enjoyed sitting on the back porch with the ceiling fans and talking a bottle of wine after a busy day of sightseeing, or playing scrabble or just listening to the water babbling in the fountain in the courtyard just down the steps. The king bed in the master was beyond comfortable, and even the pull-out was nice. The kitchen had everything we needed to cook meals when we got the urge, and the home was so spacious that the 4 of us never felt like we were on top of each other. We saw the owner who lives upstairs when we arrived, and after a warm greeting we didn't see him again, although we did see his beautiful dogs laying in the sun on occasion. Hands down the best vacation rental I've had the pleasure of visiting. It will be our home away from home any time we travel to Savannah. Hi Laurie! Thank you so much for your kind words regarding our Southern Comfort home. We look forward to hosting you again soon. That's exactly what it was like...."Home away from home". It was so comfortable. We rented a car which was smart as it has plenty of places to walk to but to get to the riverfront it was nice to drive. We ate out most of the time, so didn't use the kitchen, but it had everything we would have needed. Loved our stay!!! Would go back again. Hi Mary Ann! Thanks again for making Southern Comfort your "home away from home". This home is about a 15 minute walk to the river front, but having a car will certainly cut down on travel time. We look forward to hosting you again soon! Southern Comfort - A Big Hit! We felt like we hit the jackpot on this place as soon as we pulled into the drive! We arrived later than expected (after 10 pm), and had to call the management company because we had problems opening the lockbox. The girl who answered was so very nice -gave us another code to try and offered to send someone out to help. Fortunately, the second code worked like a charm. The name of this property is so accurate - the home was meticulous, welcoming, and we honestly felt right at home. We found everything in this remodeled beautiful home to be tastefully done, while it still maintained the older charm and character. We enjoyed sitting on the back patio as well as on the front porch swing. We took our miniature schnauzer with us (which we dont typically do) and he was a happy camper as well. The location is spot on! Only 2 streets over from the beautiful fountain at Forsyth Park ! And we took a short stroll the first morning to the coffee shop around the corner, then picked up a few groceries from Kroger's which was across the street from the coffee shop. The home and neighborhood is quiet and serene- honestly, as many fun things as we did in Savannah (Trolley tours, guided tour of Bonaventure Cemetery, eating on the River, etc) sitting together on the back porch overlooking the courtyard was one of our favorite memories. We met the owner of the property while there and he was very nice, wanting to make sure everything met our expectations and once he knew we were delighted with everything, he left us alone to enjoy our stay. We will definitely attempt to book this same property on our next visit! Two thumbs up! Hi Cindy! Thank you for staying at Southern Comfort. We're so happy to hear that the home and our friendly staff made your trip to Savannah one of the best yet. We look forward to hosting you again! Our stay started with a couple of hiccups - the wrong key code, lack of info on parking, Wi-Fi, etc. but most everything was resolved quickly! Then we were able to really settle in and enjoy. We met the owner on the first evening and he let us know we could use the parking space right in front - and that we were welcome to let our dog roam in the courtyard as long as she was friendly with his dogs. And his dogs seem to be very sweet! He also helped us a couple of days later when he learned that our cable wasn't working. We definitely benefitted from having the owner upstairs and running into him in the courtyard! The space is beautiful and just like we had envisioned for Savannah. In fact, we noticed a few historical walking tours walking by with people pointing at the house! The only drawback is a lack of a table to sit together for a meal. But, the island works fine for three people! The coffee shop nearby was closed during our visit but it looks really cute and was only a minute walk and right next to a grocery store. We ordered dinner from a great Italian restaurant one night and that was less than a 5-minute walk away. Forsyth Park was right there too. You can definitely feel like a local strolling through the streets - and there are plenty of places to walk a dog nearby too. It didn't take long to learn our way around the city because it's easy to navigate and definitely walkable. We wouldn't hesitate to stay here again and to recommend the home to others! Hi Carol! Thank you again for staying at Southern Comfort. We're so happy to hear that your minor issues were resolved quickly. Please know you're privy to a Return Guest discount next time you stay with us! Hi Susan! Thank you for staying at Southern Comfort. We look forward to hosting you again soon! Our annual trip with our daughter was a wonderful time the home was wonderful, in a quiet and lovely area in the historic district. The owners were friendly and welcoming. It is nice to have a place that welcomes pets as much S they do! Thank you for staying at Southern Comfort, Teddy! We look forward to hosting you again soon. After a week long vacation in Charleston and Hilton Head, SC we headed for Savannah, GA. This home is in a wonderful location. Roomy and spacious as well as nicely decorated. The amenities were perfect. Excellent wifi too. My chihuahua felt right at home. Liked having the washer/dryer available as well. Only trivial complaints were the front doorknob fell off twice. However, my husband quickly repaired it with the tools that were so cleverly available. Would love to visit here again and stay longer. Hi Suzanne! Thanks again for choosing Lucky Savannah. We're so happy to hear that both you and your LuckyPup felt at home, and please know that the doorknob issue has since been fixed. See you next time! The rental was beautiful and perfect for the four of us. There was parking available in front of the house every time we needed it. It is a little off the beaten path so quiet. You can easily walk to Forsyth Park from here. We were only in for a quick birthday weekend for my daughter so didn't use the kitchen except to make coffee. The house is very spacious, beautifully decorated and well supplied. 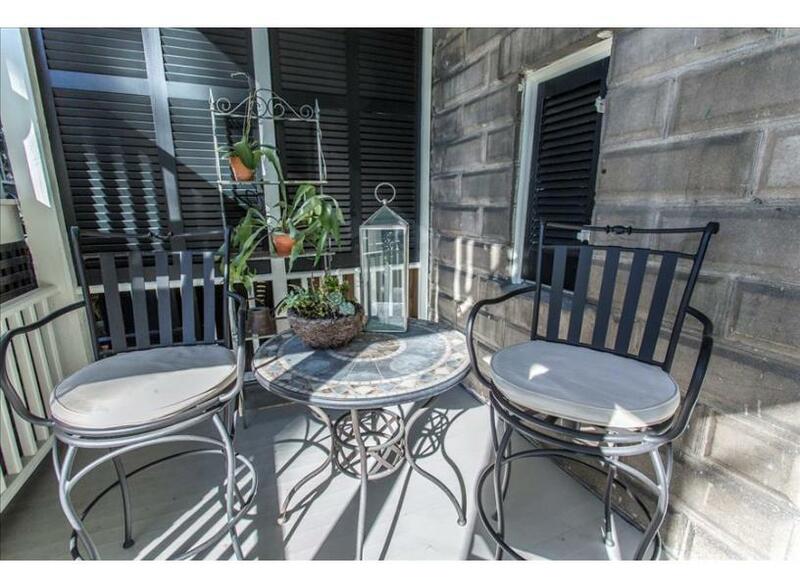 I would highly recommend this rental to anyone else looking for a place to stay in Savannah. The only thing it lacked was an additional blanket for the sofa bed. Hi Allison! Thank you for staying at Southern Comfort for your birthday weekend. We're so happy to hear that you enjoyed the location and amenities, and appreciate the blanket recommendation! See you again soon. Thanks again for choosing to stay with us, Annette! Savannah by pedicab is an amazing way to explore the city. We look forward to having you again soon. My husband and I traveled to Savannah with our Miniature Schnauzer for a conference. We loved this location! It was really nice with updated appliances. It was very close to the river and close to lots of places to walk our puppy. Kroger was just around the corner and Forsyth park was about 6 blocks away. The house was nice because there was a little fenced in back yard so it was nice to let the puppy out, but there's no grass, so he was picky and we had to walk him when he needed to go to the bathroom. Our only downside was the app that Lucky Savannah told us to use. We used it twice to make contact and never got an answer. I finally had to just call the office to get a response. Hi Michelle! Thank you again for choosing to stay at Southern Comfort. We're so happy to hear that you enjoyed the home and the location, and do apologize for the communication error within our app - we will look into that! Please know you're privy to a Return Guest discount next time you're in town. Description very accurate. Great location. Thanks for choosing Lucky Savannah, Terry! Hi Samone! Thank you again for choosing to stay with Lucky Savannah. We appreciate your suggestions and will pass them along to the appropriate team members. Hi Darlene! Glad to hear you felt at home at Southern Comfort. See you again soon! The condo was clean, well furnished and pleasant. Quiet at night. Thanks again for staying with us, William! Cannot say enough about the rental facility. Modern, clean, beautiful, conveniently located within walking distance to any of the historic sites. The APP worked terrific in providing all the basic information. We had an awsome time. Thank you for your kind words, Eduardo! We're so glad to hear that you enjoyed your stay and that our app proved helpful. See you again soon! The property was everything that the pictures looked like! And that never happens. I was so impressed with how clean and kept up it was.. and for it to be a property that welcomes pets I couldn't even tell. The area that the house is in is a great location. Close to lots of things and just a quaint quiet street. The plus to staying there as well was a non-metered parking spot which is hard to come by in Savannah. All in all my family was very impressed with our stay and we enjoyed what the property had to offer. And I just wanted to thank Sam at lucky Savannah for making it happen. I was having issues with getting this particular property for theses dates, she worked some magic and made it happen. Great customer service and call back times. Very helpful and friendly. The pricing for the total of nights we stayed was well under a hotel and in my opinion. It was just a nice change of pace rather than stay in a hotel this time. Thank you and we look forward to staying at a lucky Savannah property again! Thank you again for choosing to stay Lucky, Danielle! We can't thank you enough for your kind words about our home and rental staff, and look forward to hosting you again soon! You will love it, from the open feel, to the tasteful decorations to the huge shower! So glad to hear that you enjoyed your time at Southern Comfort, Jill! We had an awesome stay. The home was perfect and a great location. The property was a nice size and had a great backyard with a bird feeder. We had a relaxing time just sitting out watching the birds gather. The home was within walking distance of a Kroger so that was nice. The owners lived upstairs and were very friendly and even gave us flowers to put in a vase. Nice touch. Overall we had an awesome stay and would definitely stay there again. Hi Keith! Thanks again for booking with Lucky Savannah. This home in particular is an excellent place to unwind and unplug. We're so glad you enjoyed it! My family and I had a great stay. Nice location and lots of peace and quiet. Thanks again for choosing to stay with us, Tony! We look forward to hosting you and your family again soon. 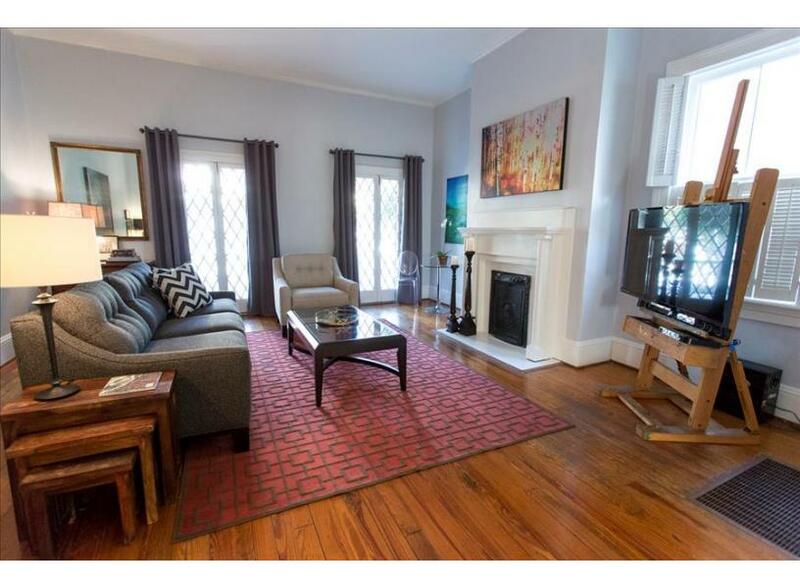 This is a lovely first floor apartment, just a short two blocks from Forsyth Park. My wife left our car in the driveway during our entire vacation and walked to all the sights in the Historic District. We also enjoyed the owner's beautiful backyard courtyard and many afternoons we would sit outside on the back porch listening to the birds and the soothing fountain. The unit is beautifully decorated and has a washer/dryer. located home. Can't wait to go back! What a great place. My wife and I love to complain for some reason, but this place was so near perfect. Not much to say at all, but great. The kitchen has all very high grade appliances and very nice pots, pans, dishes, pot holders, etc... This is a great management company. very well maintained property with quality furnishings and amenities. Quiet location with non meter off street parking. Would definitely stay here again the next time we're in Savannah! This is our second time to use Lucky Savannah and once again, it met our expectations!! We will be back again in 2016 (hopefully in the spring) and stay within the historic district as we love the closeness to everything. The rentals are clean, stocked and decor is always so nice. I have recommended your organization several times and two people have actually booked with you! We had such an incredible stay at Southern Comfort. The owners were incredibly hospitable, generous and simply lovely. We were there for our wedding and they let us use the back garden for photos. The place was impeccable decorated, yet still was cozy and inviting. The neighborhood was a block or two away from Forsyth and a few more from the center of downtown. We will definitely stay here again. Thank you for choosing Southern Comfort! We thank you for such kind words. We are thrilled to hear you enjoyed the home, as well as the location! The homeowners are great people, and always make sure everyone has a great stay! We would love to hosts you as our guests here at Lucky Savannah, again! Beautiful, clean, great location! Exactly as the photos look. We stayed at the Southern Comfort and could not have been happier. 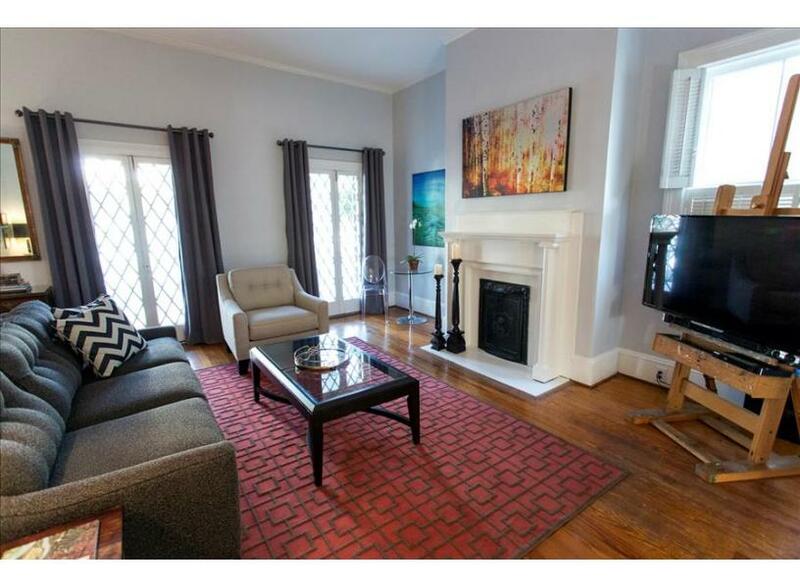 Well appointed, well located, and was great to be 3 blocks from Forsythe Park. For a 1 br it huge and was easy to have family over as well. Fell in love with this property! My daughters and I were so sad to leave Savannah. The property was on a gorgeous and peaceful street. It was so quiet that we were quite surprised to find a nice grocery, bus stops, and Forsyth Park within 2 & 3 blocks. In fact, I was amazed at how peaceful the entire city was. It's hard to believe a city can be that quiet, beautiful, and entertaining all at the same time. My only regret is that we did not stay longer because I would've loved to spend more time relaxing on the two porches and wonderful courtyard at this property. The inside was amazing and clean. Everything we could possibly need was in the home. The owner has impeccable taste and is very friendly and accommodating, if you happen to need anything. We returned in the dark in the pouring rain one evening, and he made sure the pathway was lit for us and that we found the courtyard entrance. It was much appreciated! I've never rented a property in which the check in and check out process was so keys and no worrying about office hours or signing papers. If I ever am fortunate enough to return to Savannah, I won't go unless this property is available. An incredible and relaxing place to stay! We have stayed at different properties in Savannah over the years & this was our favorite. We rented this one for an anniversary get away! The entire place was amazing, spacious, & very comfortable. It was beautifully decorated & impeccably clean. All of the architectural details even down to the old wood floors were beautiful. The kitchen was well stocked & was a pleasure to cook in. The bathroom had plenty of towels, a very nice shower & a wonderfully well lit vanity area. The large closet off the bath had plenty of room to put our luggage in & doing laundry was a breeze with the provided washer and dryer. The mattress was comfortable. The only little thing we would have changed was it would have been nice to have had a thicker & softer comforter or blanket for covers on the bed. Our favorite spot was the back porch overlooking the beautiful courtyard and fountain. The ceiling fans on the porch help keep the Georgia bugs away. We spent a lot of time just relaxing on the porch. We also loved swinging in the swing on the front porch. We enjoyed the selection of moves & books provided. The home was on a quiet street & the parking was good. We met the owners & they were very friendly & gracious. It was in short walking distance to a Kroger grocery store & a little coffee shop. Check in & check out was simple & communication was good with the rental company as well. I would highly recommend downloading the app from the rental company because it was a wealth of information & a huge help with instructions for the home. We also enjoyed going out to the beach on Tybee Island & then eating at the Crab Shack there which has great seafood. Savannah will always be one of our favorite places to visit. I think we probably could have just moved right in, but since that's not a possibility,we can't wait until we can come back & stay here again & just relax. Thank you! The house was perfect for us and our furbabies, beautifully decorated and very well maintained, the courtyard was perfect, the furbabies loved it as well! 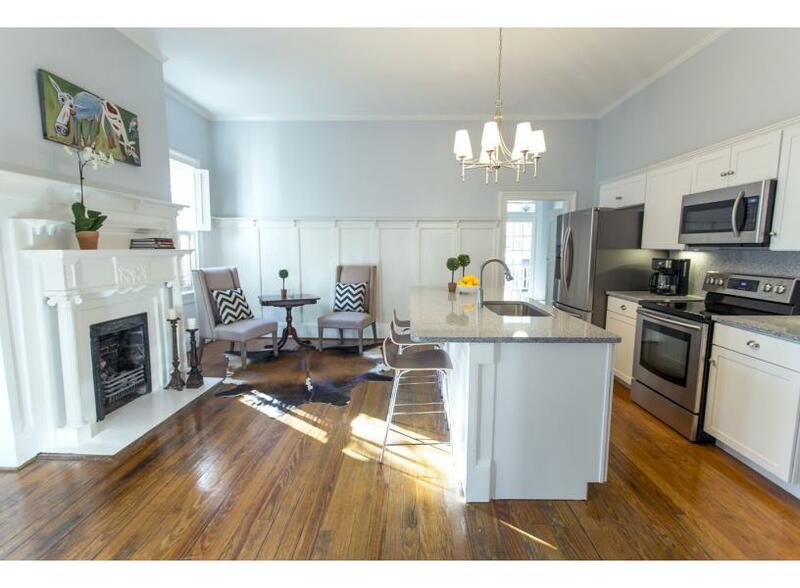 The owners were extremely gracious and have a perfect home to enjoy in historic Savannah. We had a wonderful week and would definitely rent this house again. Thank you for choosing to stay with Lucky Savannah! 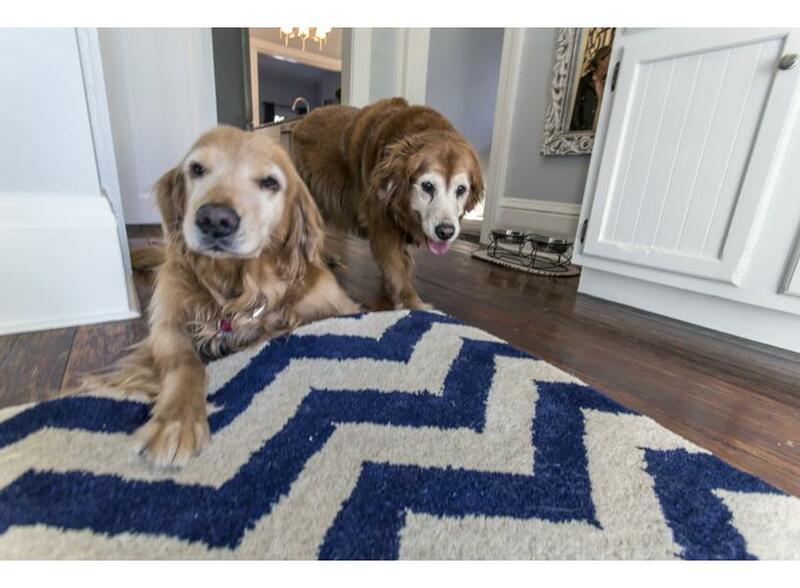 Southern Comfort is a great home, than can accommodate you and your furry friends. We are thrilled to hear you all had a wonderful time here in Savannah. We can't wait to have you all as our guests again soon! Please don't forget about our 10% "Returning Guest" discount. We couldn't have asked for anything better. The home was absolutely perfect for our needs. Very spacious and close to most places. We really enjoyed the flat, it was exactly as pictured if not better. Our standard poodle 'Rasta' loved being there as well. 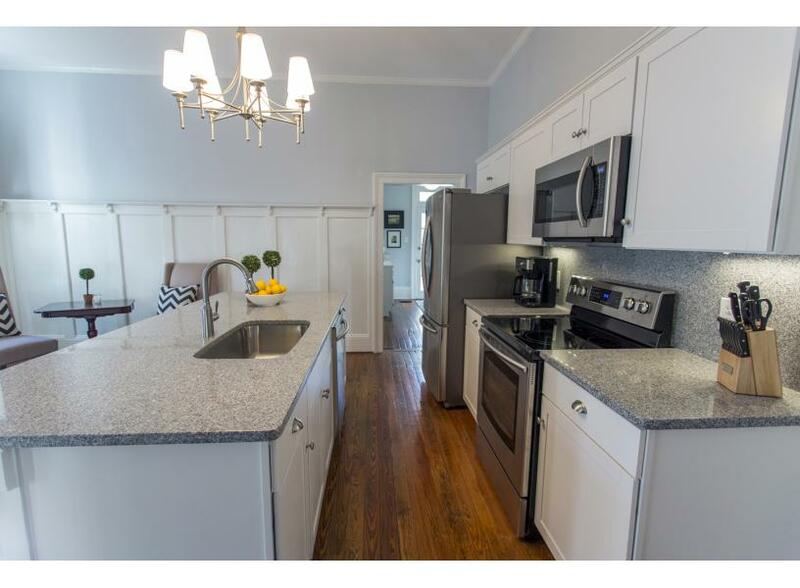 The flat is within walking distance to Kroger and Forsyth Park. The owners were very welcoming. A Perfect Stay In Savannah! My wife and I had a great experience at this property with our dog. The property is in excellent condition, well maintained, clean and actually feels larger than described. We met the owners who were extremely friendly and checked in on us to make sure everything was met our expectations. We will definitely stay here again! Thank you for choosing to stay with Lucky Savannah! We are so glad Southern Comfort was a great fit for you all. We appreciate the kind,honest review! We hope to see you in Savannah again very soon. We loved this place. Very clean, plenty of space, all of the amenities you can think of. I would definitely recommend this place to anyone. Thank you for choosing to stay with Lucky Savannah! We are so glad you found the home to be clean and enjoyed the amenities of the home. We thank you for recommending this home to others! We sure hope to have you as our guests again, in the near future. Don't forget about our 10% "Returning Guest" discount! As a native of Savannah it is gratifying to see a historic property so lovingly maintained. 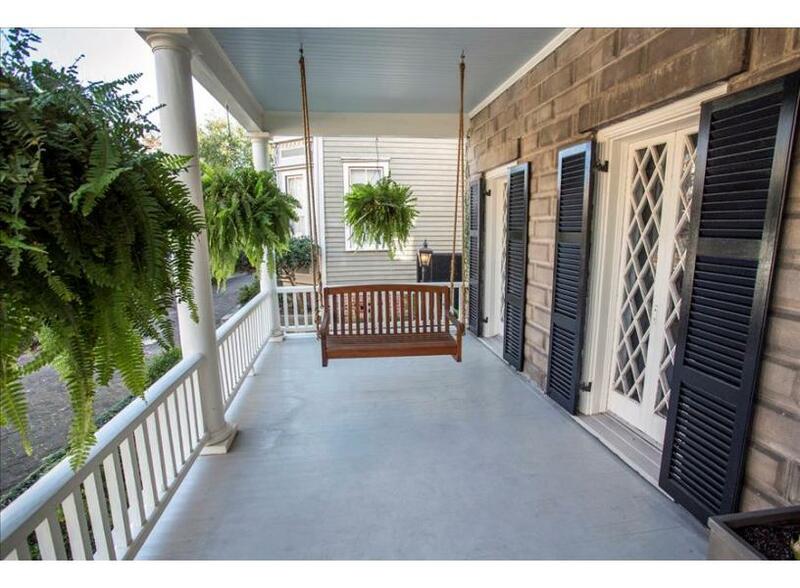 From the porch hammock to the beautiful courtyard Southern Comfort is a complete delight. The owners (and their dogs) were charming and accommodating. We hated to leave! I am left with only two suggestions, higher wattage for the lamps and a lock for the bathroom door. My only hesitation in posting this "rave" is my fear that my choice will not be available when i want it! Thanks again for a lovely visit. Thank you for choosing to stay with Lucky Savannah! We are so thrilled the home was suitable for you all. Southern Comfort is a great place to stay, while visiting Savannah! We are glad we could share this special home with you all, for that special occasion. Beautiful property and fabulous location. We had our small dog with us and she loved it too. Thank you for choosing to stay with Lucky Savannah! We are so glad to hear you all found the home to be beautiful, and in a great location. Southern Comfort is located in a prime location, close to many great attractions! We hope you all stay with Lucky again. My wife and I had an opportunity to stay for one night in this lovely home. While it's just 1 BR, it's huge, with plenty of space to stretch out. 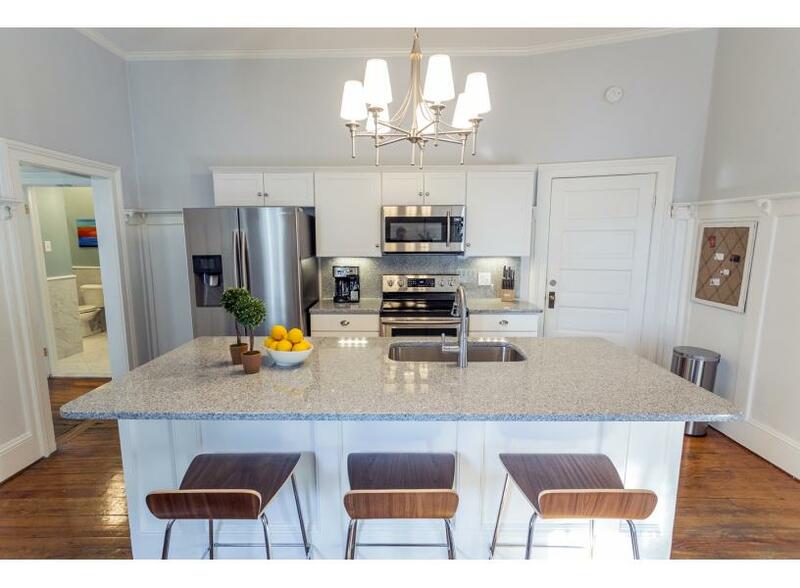 The kitchen is beautiful, and useful, complete with marble everywhere and modern appliances. Big living room with large pocket doors that close for privacy. The King bed was comfy and the bathroom large and beautiful. There was also a large walk-in closet off the bathroom, and adjacent to the BR. 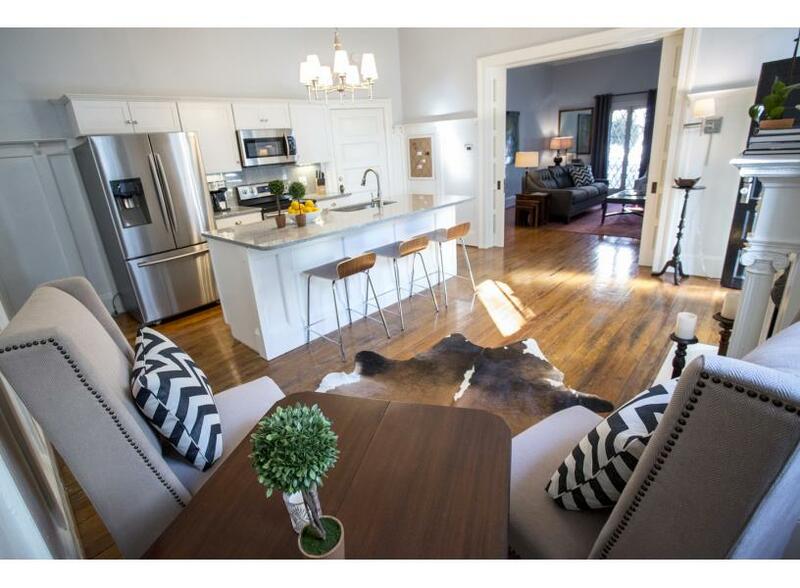 Would not only highly recommend this home, but the folks at Lucky Savannah too. This is our second time renting from them, in two different accommodations, and they did an outstanding job. Thank you for choosing to stay with Lucky Savannah! We are so thrilled to hear you loved Southern Comfort. This home is definitely in a great location, with so much to offer. We hope you have the opportunity to visit Southern Comfort again during your next Savannah vacation. Thank you for the kind words! Lovely home on quiet street, close walking distance to most everything. Great fun, great location, great house with all the expected historic charm. My sister and I and her adorable dog, Molly, had the most memorable "sisters weekend" at Southern Comfort. The house was impeccable and beautifully appointed. Comfort was, indeed, around every corner. It is located within the historic district (where we spent most of our time) and a block away from one is Savannah's many beautiful parks. Kroger is a short half-block walk. We Also took advantage of the large, quiet back porch and spent some of our evenings unwinding there amid the peaceful garden. We thoroughly enjoyed our stay and highly recommend Southern Comfort! We definitely enjoyed our stay here. The street was quiet and dog friendly. 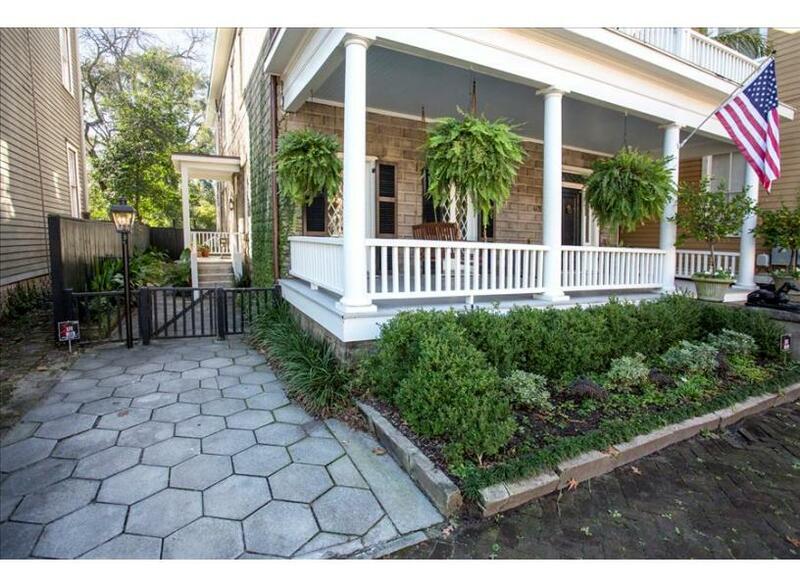 The owner's did a great job with renovating and keeping the historical integrity of this home. 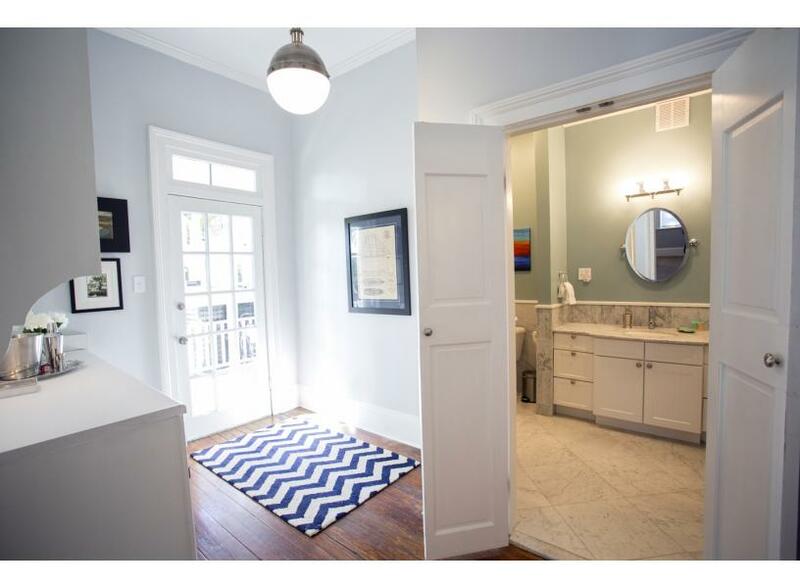 We loved the modern conveniences with old Savannah style. We also enjoyed the beautiful quiet courtyard off the back porch. The description in the ad was very accurate. We would love to stay here again. Thank you for choosing to stay with Lucky Savannah! Southern Comfort has so much to offer, and we are glad to hear you enjoyed your stay. The owners put a lot of work into this home to make it special, and relaxing! We are thrilled you all enjoyed the courtyard and would love to stay again. Please don't forget about our 10% "Returning Guest" discount!